These are square shaped from the bottom side. 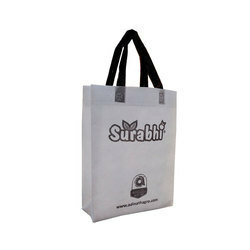 Loop Handle Non Woven Bags with same fabric handle. 10 colors are available in this product. They are durable and easy to hold. Printing on Box side also. Copper print on bags. Customized size, design, print also available. Usage: Advertising as well as carrying material.